The National Museum of Scotland is in the heart of Edinburgh's Old Town. 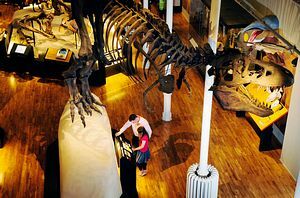 The museum, which has recently undergone a £47.4 million redevelopment, offers one of the UK's best days out. Featuring spectacular Victorian architecture combined with an exciting modern building, the museum houses galleries dedicated to the natural world, science and technology, art and design, world cultures and the story of Scotland. From dinosaur bones to designer chairs and mummies to motors, a creative world of discovery awaits on every floor. There are three interactive galleries designed specifically for families Connect, Imagine and Adventure Planet, a new learning centre and a large gallery for hosting international touring exhibitions. There's an exciting new range of shops, cafes and restaurants including the Museum Brasserie and Balcony Cafe. There is a fantastic range of activities and events throughout the year from Museum Lates, to storytelling for children, full details can be found on the National Museum of Scotland website. The National Museum of Scotland is situated on Chambers Street, in the heart of the old town, a few minutes' walk from Princes Street and the Royal Museum. Chambers Street links George IV Bridge and South Bridge.